Halloween is coming! Halloween is coming! One of my FAVORITE holidays! I haven't had one in awhile, but I've hosted quite a few Halloween parties in the past. 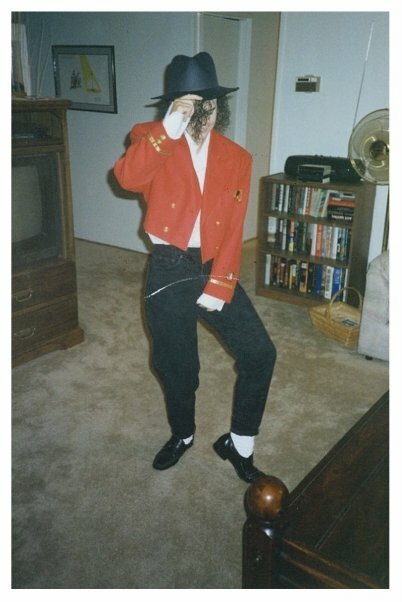 The main rule was that all costumes had to be homemade. Those are the best because everyone is forced to be creative. Even those that think they aren't creative. 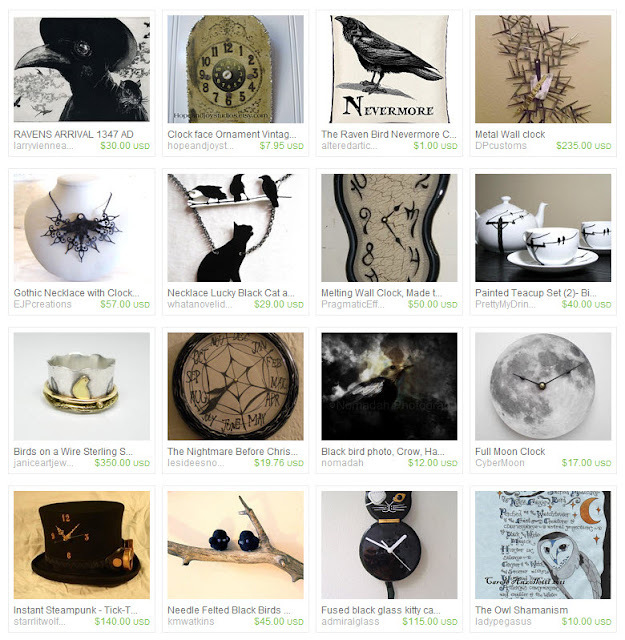 I created this week's Etsy Treasury with Halloween and a little Steampunk in mind. 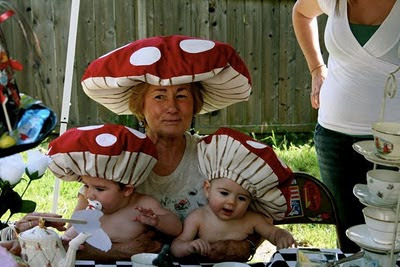 Friends as mushrooms. The big 'shroom made the hats. 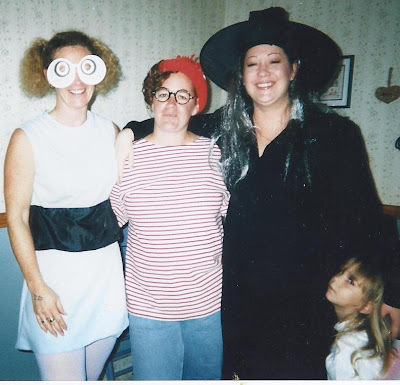 Me (Powerpuff Girl) and my sisters (and my niece). Hey... where's Waldo? Us as the Brady Bunch. 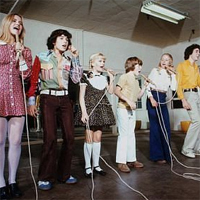 No wait, that IS the Brady Bunch. 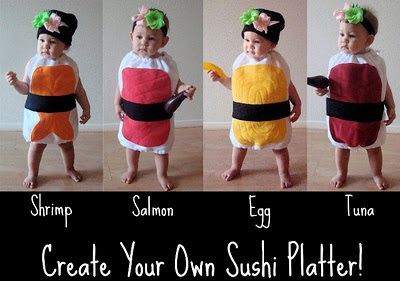 And how is this for a super cute costume... sushi! The costume is easy for infants and toddlers to wear since there's nothing over the face, and you have easy access to diapers. Love it! These and many other great costumes can be ordered from the shop Not The Kitchen Sink on Etsy and are promised to arrive by Halloween! Order your own custom made sushi costume on Etsy..
Wow, I haven't even thought about my costume this year. Got any ideas? My X wasn't a big dresser upper either so I always made him my 'straight man'. Things like he was Inspector Clouseau to my Pink Panther. All he had to do was wear a trench coat. A bonus was that after him being my 'straight man' for a couple of years, he actually asked to have a costume that wasn't so boring! I remember having that problem. So I just made him the side kick to my costumes. For example I was the Pink Panther and he was Inspector Clouseau. After a few years of me getting all of the attention for the 'cool costume' and he wanted in on the action. And the rest is history. great costumes.....everyday things and people make the best costumes. What about the Energizer Bunny and battery? I loved that one. Ahh yes, that was a good one! I'll have to dig a bit deeper to see if I can locate pictures.